It was one of those off-kilter days. I hadn’t set up a destination to send my daypack to the next morning. Maybe the run-in with the angry hotel owner the day before had soured me on picking places out of the guidebook. So out of denial or laziness I ended up carrying everything in my big backpack. I was strong after seven days of walking, right? I texted Tami to see when she was leaving, and she texted back that she’d already left at 7:30. She hadn’t wanted to disturb me. That was fine. I thought we would catch up with each other later in the day. There wasn’t a good place to have breakfast near the hotel, so I just started walking out of town. 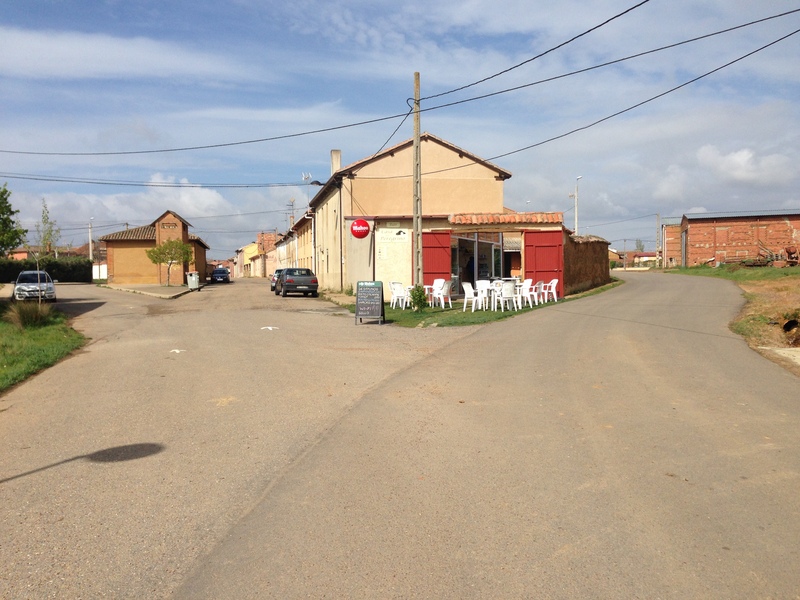 There had to be something in the next village, called Calzada del Coto. Well, Calzada del Coto was totally locked up. After walking for an hour on an empty stomach and no caffeine I was a little punchy. I was used to villages with all the doors and windows closed, but this morning it bothered me. I can remember bad dreams as a kid where I went from door to door in a panic and no one answered. That’s what this village reminded me of. I spent at least 30 minutes circling through the major streets and back to the beginning of town and no cafe/bar! Not a good use of walking time. So I kept going, and going, and going. And I could feel the pressure of my heavy pack on my feet. Finally, in Bercianos, I saw signs of cafe/bar life up ahead. 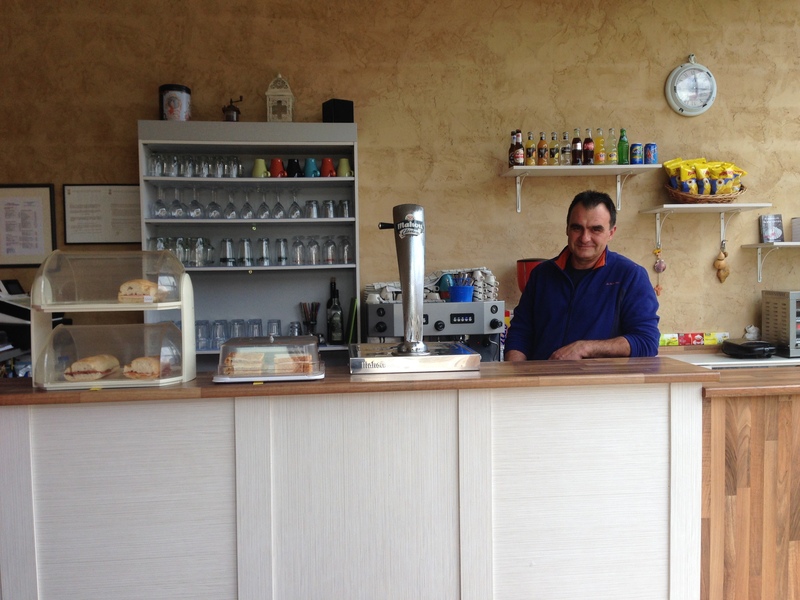 Some enterprising person had opened a cafe/bar right as the Camino entered town. It was a sight for sore eyes! Coffee! Brunch/Lunch! I took off my pack and ordered cafe con leche, and a tuna empanada. Yum! I checked my phone. Tami’s text said that she had gotten in a taxi with two French pilgrims and she was now in Mansilla de las Mulas, two stages ahead, and was sorry we were out of synch. I was sorry, too, but totally understood her need to keep moving to make it to Santiago. 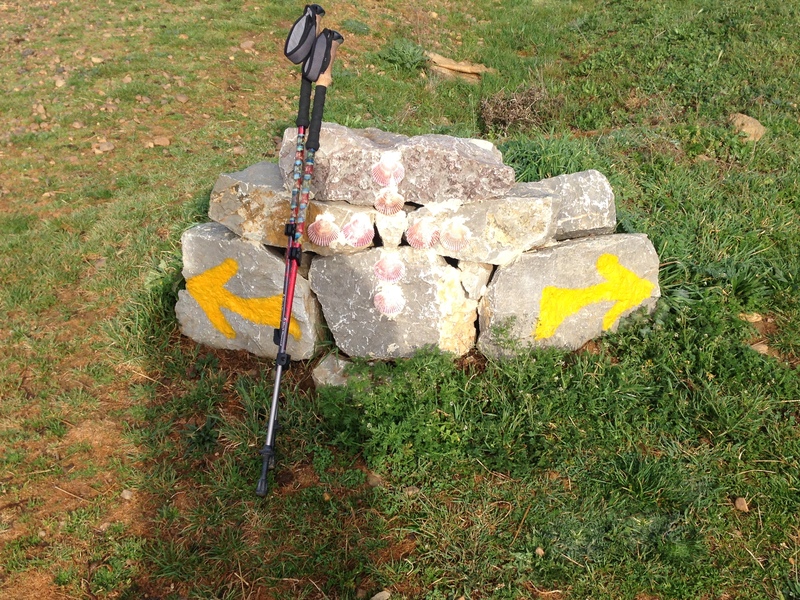 I noticed that there were very few pilgrims on the Camino that morning. It’s the most popular part to bus through. I complimented the cafe owner on such a nice place, and he said that the Brierley guide was sending pilgrims on the alternate Roman Road route, bypassing his village, so he didn’t have as much business as he’d like. He and his wife were so nice, and I hung out with them for awhile enjoying the sunshine. Past Bercianos, I was back on the classic senda path. 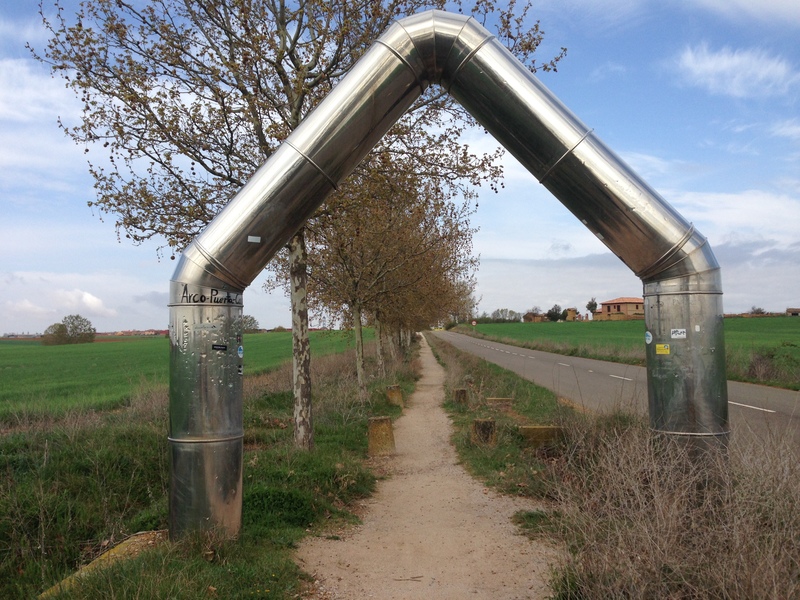 Someone had set up a chrome arch, which was one of my favorite sculptures on the Camino. Very simple, but it reminded me of the various “gates” we’re supposed to pass through in our lifetimes: birth, puberty, falling in love, aging, etc. There was a rest area next to an Ermita (locked!) and I took off my boots for awhile to give my feet a rest. 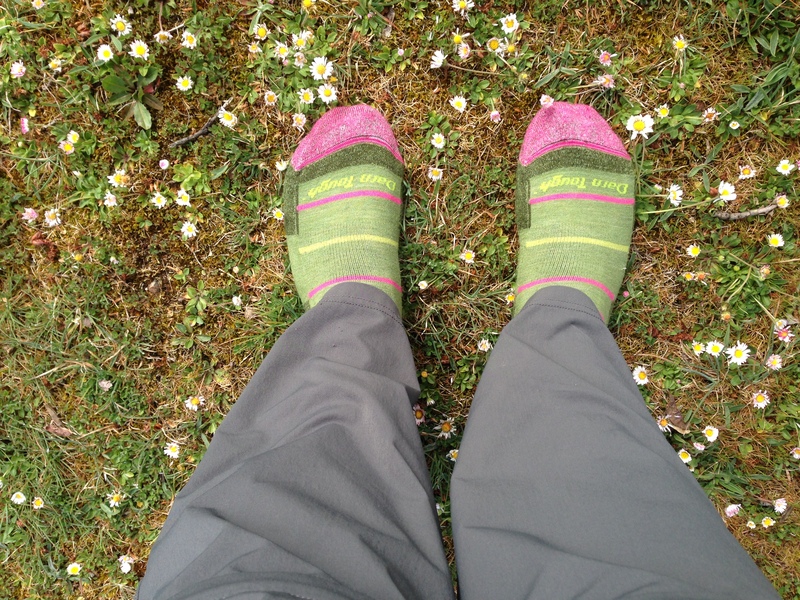 Pink and green socks for a spring Camino! I was all by myself for awhile there by the Ermita and felt called to do Morning Prayer on my Iphone app. An elderly man came by with a bucket and he said he was gathering herbs for his chickens! I got into El Burgo Ranero and checked out Albergue La Laguna, and I must not have looked too impressed. The albergue guy was Italian and said, “I you should go down to Piedras Blancas, you might like it better.” It was a nicer place, and my feet were hurting, so I stayed. Turns out the same people own a group of albergues and hostals in the next few towns. My room was directly over the bar and the place was packed with men drinking and being very loud. I went downstairs before dinner and the Italian guy I’d met at the other albergue was hanging out there. “Isabel! (I sometimes become Isabel because people in Spain couldn’t pronounce Beth) you must meet my friend.” His friend was an older Spanish pilgrim whose Spanish was so fast, I got about every 20th word. “Mas lento, por favor!” I said over and over, but he never slowed down and I found myself nodding my head as if I did understood. It was old school conditioning to be the female who just keeps listening. Then I thought to myself, “this is ridiculous,” and excused myself to go call my mother, which I did. Dinner turned out to be excellent fish, and the wine of the house was better than usual. I picked out the place to send my daypack in the morning. The guy at the desk whose job it was to call the pack shipping company said, “you know it’s only six kilometers to Reliegos!” Yes, six kilometers was fine. After 17K with my full pack I was ready for a shorter day of walking. So the end of the off-kilter day found me in a warm hotel room with radiators to dry my clothes on hoping for a easier walk, and a cafe con leche and tostas before heading out in the morning. Hey “Isabel!” Sorry couldn’t resist after being called by my old family name yesterday, by someone who’s known me all of six months, who heard it from a person I’d gone to school with from K -12! Grrr!!!! One of the few draw-backs to being back where you grew up…! I’ll be fine, I’ll get back by telling her Mom! Not really…but tempted. LOVE, love, love the socks — Darned right! You ARE “Darn Tough” Bunkie!! Don’t ever forget it, even after a not so good day on the Camino! Calling Mom was the BEST of ideas! Love her dearly, love you more (but don’t tell; hee, hee!) Guessing you were tired enough after such a long, hard day to sleep well despite the hubbub in the bar below? Yikes!! Walk on , walk on mi amiga! Loving the fill-ins! One more to Burgos, right? LOVE, love, love the socks — Darned right, you ARE “Darn Though” Bunkie!! Don’t ever forget it, even after a not so good day on the Camino! Calling Mom was the BEST of ideas! Love her dearly, love you more (but don’t tell hee, hee!) Guessing you were tired enough after such a long, hard day to sleep well despite the hubbub in the bar below, yikes!! I stopped at that same cafe/bar at that corner into town. They were friendly!! !